Heat the oil over medium heat in a large soup pot. Add the onion and garlic and cook, stirring until softened, about 5 minutes. Add the squash, potatoes, broth, curry powder, and salt and bring to a boil. 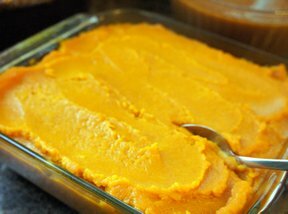 Reduce the heat to medium-low and simmer until the squash and potatoes are tender, about 15 minutes. 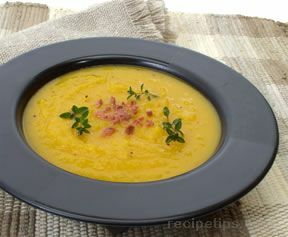 Remove the soup from the heat, stir in the honey, and puree until smooth in the pot using an immersion blender or in two batches in a regular blender. (I like to puree only half so there are potato/squash pieces in the soup). Thin with skim milk (about 1 C.). Taste and season with salt, if necessary. To serve, ladle the soup into the serving bowls and drizzle with the yogurt (optional). *Mild curry powder works best. You may want to start with one tablespoon of curry powder and add more to taste.